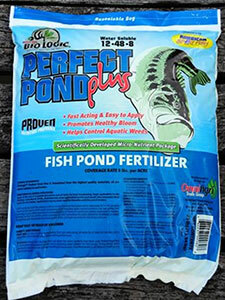 Perfect Pond Plus, with a scientifically developed micronutrient package, has been developed in part by the pros at American Sport Fish Hatchery. This water-soluble fertilizer is simply broadcast at a base rate of 5 pounds per acre and is much easier than messy, heavy liquids. BioLogic™ Perfect Pond Plus is formulated from the highest quality water soluble materials that will dissolve in the upper 2 feet of the water column. This state-of-the-art formula encourages an optimum bloom and adds micronutrients for healthier fish. Use as directed and recommended.